Continuing an unchallenged reputation for leadership, Freas offers again, as it always has, the finest conditioning ovens available anywhere. With their outstanding uniformity and reliability, you can be sure of obtaining precise moisture determinations. Available in either a mechanical or gravity convection model, these cabinets offer such Freas features as advanced styling, electronic control and a temperature dial calibrated in both centigrade and fahrenheit. In addition, both models have top mounted Torsion balances with suspension mechanism extending into the oven working chamber to accommodate sample baskets. All the other famous Freas features are included, stainless steel interiors, protected, low watt density, black heat heater banks, handy record card holder and double wall construction that keeps the outside cool to the touch. As always—the safest, the most dependable, the best — from Freas. 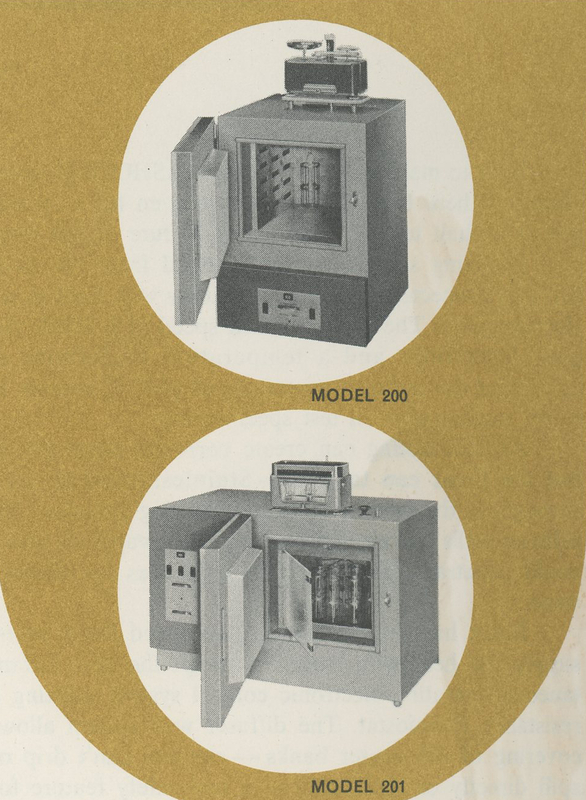 The Model 200 Conditioning Oven corresponds to Freas Gravity Convection Oven Model 104 with enameled exterior finish as described on pages 12 and 13, except stop on thermostat control limits maximum to 200° C. The Model 201 Conditioning Oven corresponds to Freas Mechanical Convection Oven Model 605 with enamled exterior finish as described on pages 10 and 11, except stop on thermostat control limits maximum to 200° C. Balance for Model 200: Torsion No. LA-3 (sensitivity 0.02 grams, capacity 200 grams) and suspension with one sample basket. Balance for Model 201: Torsion No. RX-1 (sensitivity, 2 mg., capacity 120 grams) and selective sample suspension and eight sample baskets and tare weight. Temperature limit protects balance from damage. With Cat. No. 31498C Thermometer (0 to 350° C.), two expanded metal shelves, and balances and suspensions as described. Model 201 has inner glass door. Both models equipped with terminal blocks for electrical connections. Both models operate on 120/240 V. 60 cycle, 3 wire A.C. Model 200,1200 watts; Model 201,2600 watts. Ovens with other electrical characteristics built on order. Ask for quotation.